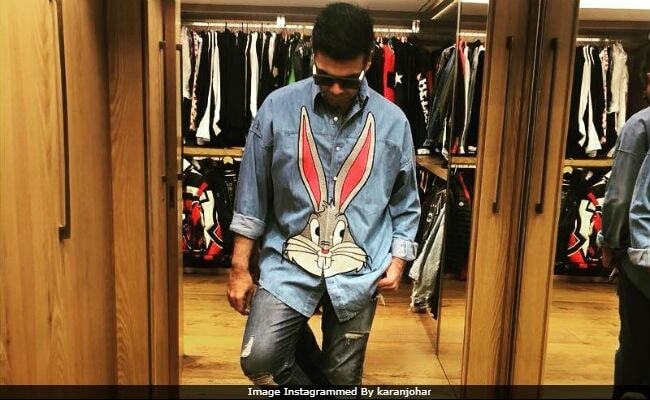 Karan Johar recently shared a picture of himself wearing a Bugs Bunny-themed shirt and hilariously captioned it as, "Dad at 45! This is the result!" Filmmaker Karan Johar recently shared a picture of himself wearing a Bugs Bunny-themed shirt and hilariously captioned it as, "Dad at 45! This is the result!" Karan Johar, Roohi and Yash's doting dad, looks super cool in the picture. He has paired his Bugs Bunny-themed shirt with ripped jeans and his Kaala Chashma swag just cannot be missed. The picture has been liked by celebs like Alia Bhatt, Katrina Kaif, Tiger Shroff, Arjun Kapoor, Parineeti Chopra, Malaika Arora, Kriti Sanon, Sonakshi Sinha and several others. "Crushing on your shirt" and "Karan Johar, where can we find such shirts?" are some of the comments posted on the picture. Take a look at Karan Johar's picture here. Over the weekend, Karan Johar had a 'mini meltdown,' courtesy his daughter Roohi. "She said 'papa.' It's time for my mini meltdown," he tweeted. She said "papa"! It's time for my mini meltdown! Karan Johar's twins Roohi and Yash were born via surrogacy in February 2016. He celebrated their first birthday at his Mumbai home and invited close friends like Rani Mukerji, Kareena Kapoor and her son Taimur, Alia Bhatt, Shweta Bachchan Nanda and Sidharth Malhotra. On International Women's Day, Karan Johar shared a beautiful message for Roohi with a tribute to mom Hiroo Johar. "I was raised by a woman who had a strong mind... an independent mind and a solid soul... she taught me how to live a fearless life along with a strong sense of right and wrong! She also taught me the art of abandon! She made me the man I am... a man who is honoured to be raised by a woman of substance! Roohi my darling, I hope I raise you to be just like your grandmother," he captioned his post. Of Roohi and Yash, Karan Johar earlier told news agency PTI, "When I saw them for the first time, I didn't realise there were tears rolling down. I couldn't believe they were two big pieces of me who are staring at me, who are innocent, vulnerable. It was the most surreal overwhelming emotion I have ever experienced."